I had another great day yesterday exploring the city. It’s a big city and I feel the lists of things to see and do are endless. (Good thing I am planning to stay for a while) It really is metropolis and a beautiful one that is. It feels very international, I didn’t feel that in the south at all. I also noticed already that more people speak English than in Málaga, which in theory is a curse but in practice- a blessing! It’s good and well that you need to use the Spanish to learn it, but it’s quite so frustrating when you don’t have the words you need to say what you want to say! I will be spending the morning searching that website I told you about for interesting rooms, calling them (scary!) and see how fast I can go see the rooms and meet the people. Yesterday I went to have a look at the Festa del Cel that I told about saturday. It was completely crowded all the way along the beach, on the beach, on steps and benches, and I was lucky to get a table at one of the chiringuitos (beach bars) in the shadow. (The sun was burrrrning.) It was cool.So many different airplanes and shows, but my favourite was the Patrouille de France (PAF), the precision aerobatic demonstration team of the French Air Force. 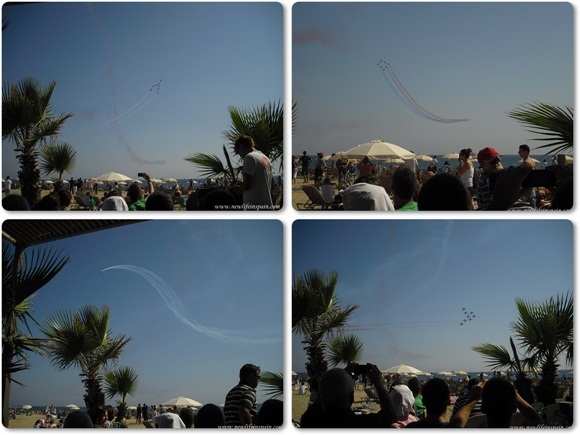 They put on a great show with their breathtaking synchronic flying and coloured smoke. Another part of the show that caught my attention was the Breitling Wingwalkers, an aerobatic formation team. A person standing and walking around on the plane doing aerobatics while the plane is also doing aerobatics; loops rolls, and turns. Impressive! Oh, by the way, I learned that FESTA DEL CEL, means Fiesta del Cielo, which means Party in the sky. The title is in Catalan. I haven't been here long enough to know if it's true that it is a problem to learn Spanish in a Catalan city, but I have already seen that the two languages are indeed different. PS: Ser du skriver engelsk på bloggen, men siden du skrev kommentaren på bloggen min på norsk, går jeg utifra at det er i orden at jeg skriver på norsk?